If you the one have a special care of hair health, you should carefully choose good brush/comb. We are pleased to offer you a product set of Parawood detangling brush Peachwood wide tooth brush, and Peachwood handle wide tooth brush, economic product crafted from real wood in Thailand. Whether your hair is thick, thin, curly, or straight; our product will surely work well for all hair types. Why should you use our wooden brush? Its bristles will stimulate your scalp like you have a mini scalp massage when it is used, releasing natural oil through your hair which increases blood flow to scalp, then your hair will grow sturdily. We select local Parawood to craft our wooden hair brush/comb as it is hard wood mainly used in many types of furniture manufacturing. Featuring light color, Parawood also well matches with other beauty accessories on your dressing table. There is less dandruff in all genders and ages. According to research, it was found that using wooden comb has lower percentage of dandruff than using plastic comb and metal combs, 230% and 187% respectively. Our Peachwood comb is crafted from 100% pure wood, so there is no bacteria growth like one in a plastic product. Our wooden comb is easier to comb your hair than plastic comb as wood is natural material that can be smoothly moved on your hair, faster than plastic comb. Therefore, our wooden comb is also great for ones with dry hair. Our wide tooth wooden comb is not likely to pull or split hair, especially when it is used on your wavy or curly hair. It is easier to comb your hair even in some specific parts. PERFECT SET: We offer a complete 3-in-1 product set including a Parawood detangling brush (2.60" W x 8.82" L x 1.18" H), a Peach wood wide tooth comb (1.97" W x 6.50" L x 0.47" H) and a Peach wood handle wide tooth comb (1.97" W x 7.28" L x 0.47" H) ready for every situation. 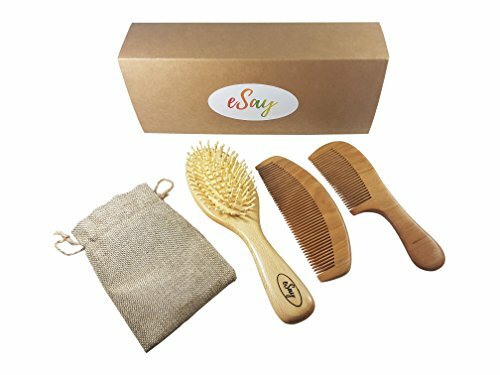 In addition, our set comes with Natural burlap bag for cover head of Para wood detangling brush. FEEL LIKE SCALP MASSAGE: When it is used, paddle brush on Parawood detangling brush will help stimulate your scalp, releasing natural oil through your hair which will make your hair grow sturdily. HAIR SOLUTION: Our product can be used to reduce hair problems like hair breakage or hair frizz, helping your hair look healthier. FOR ALL GENDERS: No matter what gender you are, every time you use our product, your hair will be more beautiful and healthy. WE HOPE YOU ARE SATISFIED WITH OUR PRODUCT: If you are not satisfied with your order for any reason or with our product quality, please feel free to send the product back to us and a full refund will be returned to you. If you have any questions about this product by eSay, contact us by completing and submitting the form below. If you are looking for a specif part number, please include it with your message.